Caving is a committing sport that requires team work combined with self-reliance. This page will introduce you to the sport and tell you a little about the DCC. Other pages cover Caving activities, training, expeditions, etc. in more detail. Caving | Caving areas | Clubs | The DCC | Safety in caving | Cave conservation | What next? Caving is a sport enjoyed by an estimated 5-10,000 people in the UK alone. No one knows for certain how many cavers there are as we tend to keep a low profile with the authorities, preferring to control our own activities and membership with minimum outside help (whilst staying within the law, of course) except for some financial support towards training and rescue services. 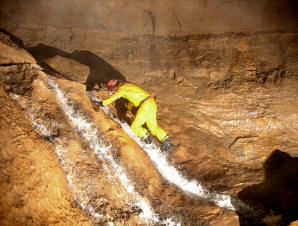 Cavers are essentially individuals competing not against each other but against the elements. When you climb a rock face, you can abseil back down and when you run a race, you walk away from the final tape but when you reach the end of a cave, you have to come all the way back out, which is often uphill all the way. Caving, or speleology as it sometimes more grandly known, combines many interests, starting with the purely physical activity of getting yourself and your equipment through all the obstacles a cave can provide. Many cavers or potholers (which mean the same thing to us) spend all their caving careers bottoming pots in different areas of the country. However, as your interest develops, you may want to try looking for new caves - digging, as it is known in the trade - or photography, mapping caves, cave radio and electronics, expeditions, rescue work, geology, biospeleology, and so on. All of these activities are catered for by the British Cave Research Association (BCRA) and some of them are supported by most clubs, such as the Derbyshire Caving Club..
WHERE CAN I GO CAVING? You can find out more about caving areas, mining areas and other underground places on separate pages. The map below, provided by Google, has markers on the main areas of caving in the UK as well as a few other European locations. If the place name is underlined when you hover the mouse over a marker, then there is a link to a page about that place. Click on pointers for more information about the places marked. Club caving is traditionally at the heart of the sport. With recent trends in lighter weight equipment and the increase in personal disposable income, cavers are now more than likely to have some of their own equipment but when the sport started, it was essential to be join a club to be able to afford and, usually, make the equipment you needed. Clubs still provide a useful resource as they keep records and libraries of information about caves, help you meet like-minded individuals in your area, provide insurance cover, produce newsletters (and websites!) to pass on information from the national bodies, and so on. However, by far the most important feature of a club is the friendship you create which could well last your whole adult life and the ability to share in the hardships as well as the pleasures of caving. Our recommendation to all potential cavers is to join a club (preferably the DCC, we need your subscriptions!) rather than try to go it alone. By the way, although men still make up the majority of members of clubs, women are extremely welcome and make cavers who are just as capable as many men except they are probably a bit more responsible than their male counterparts; ask any caver's wife or partner! 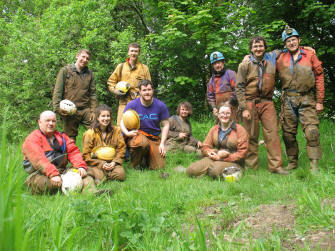 WHAT DOES THE DERBYSHIRE CAVING CLUB DO? The DCC is a typical local club in that we draw our membership from the area around Stockport in Greater Manchester. Members come from the surrounding area including South Manchester and North and East Cheshire. The Club has two main groups although there is no formal division between these groups and the members meet socially and for quarterly General Meetings, as a whole. The two interest groups are caving and mining. The caving group is regularly active in Derbyshire, Yorkshire and elsewhere while the mining group is mostly focused on Alderley Edge but also visits mines in North Wales, Derbyshire, Cumbria and Durham. More details on the mining side of the club is available on another page of this site. You will also find out about the resources of the DCC on this site and the expeditions and projects with which our members have been involved. The Club also runs and joins in with other Clubs' expeditions. These often provide a good means to find out about other cavers ideas and techniques and help you to improve your own, as well as having a good holiday. There is no question but that caving is a hazardous activity but by taking sensible precautions, it does not need to lead to accidents. Most accidents to experienced cavers arise out of difficult to foresee events such as rock falls or exceptional weather events. However, cavers still take safety seriously and indeed provide cave rescue services at no cost to each other, even though these officially come under the Police. We have a separate page on this site that discusses safety in caving and mining. Cave conservation is essential as caves are a fragile environment that may have taken millions of years to form. We have a separate page on this site that covers cave conservation and includes a leaflet published by the British Caving Association. and we will get in touch with you and see whether we can offer you the sort of caving interest you are looking for. Looking forward to meeting you underground some time!